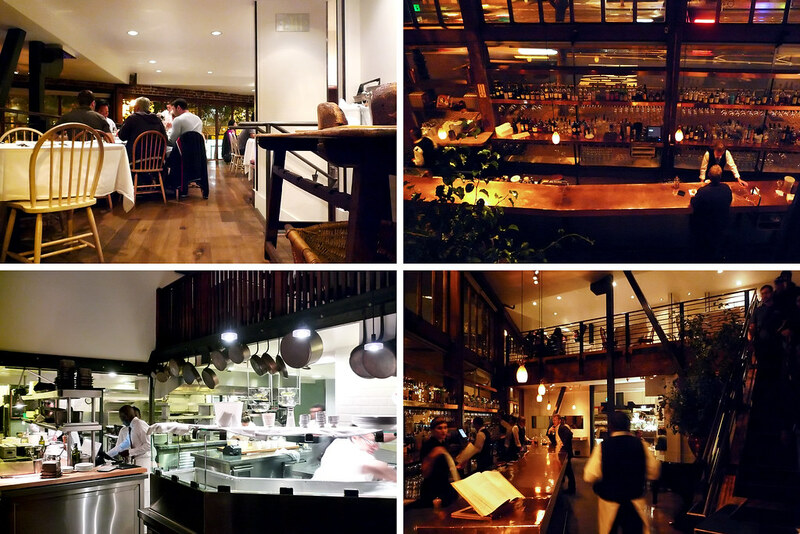 In this solo dining adventure, Gary has a late supper at San Francisco’s Zuni Cafe in order to try their burger. Whenever I travel within the United States, I try to have at least one burger in the city I’m visiting. As I’ve mentioned in the past, I’m a burger aficionado and I’m always on the lookout for a possible great burger experience and I like to see if different regions in the country do burgers differently than in New York City. So when I was doing my due diligence in preparation for my trip to San Francisco this past June, I consulted with friends and the Internet to determine just where I should be having a burger. After careful consideration (okay, I just told myself to pick one from the recommendations and just go with it), I decided on Zuni Cafe since it was close to the hotel I was staying on my first night in the Bay Area. 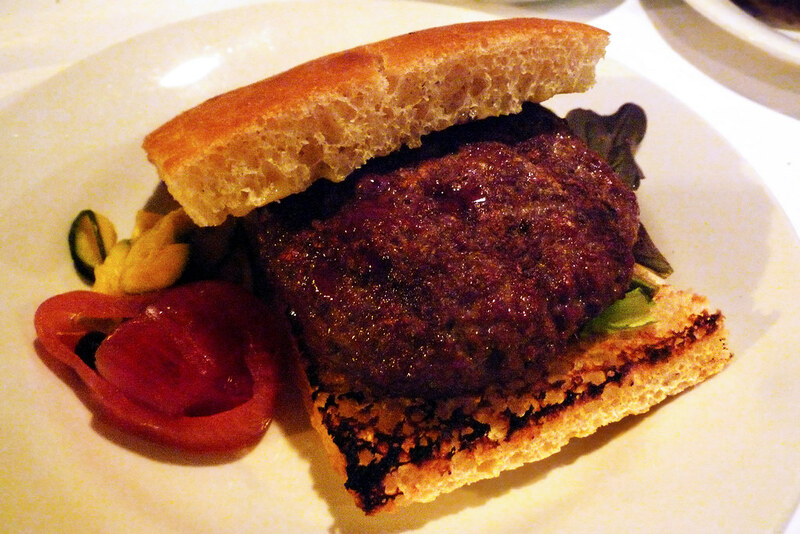 Zuni Cafe shows up on a lot of “best burger” lists in San Francisco so it seemed like it would be a good choice. I just had to wait until dinner service ended at 10 pm before I could order the burger because their limited grill space was devoted to turning out dinner entrées with no room for burger orders (as explained by my server). That was fine by me since I’d already had a late breakfast and then spent the better part of the late afternoon snacking on dim sum so a late dinner worked out just fine. I actually got there a little after 9:30 pm but it wasn’t too busy so they were happy to put in my burger order then. Not longer after I ordered, my meal came out. The burger at Zuni Cafe is a minimalist presentation – just the burger on grilled rosemary focaccia with some lettuce, aïoli, and assorted pickled vegetables. I ordered it medium-rare (when do I not?) and, as you can tell from the photos above, there’s quite the pocket of red beef tucked in the middle of a browned, though not charred, exterior. I would have preferred a better char on the burger purely for the purpose of presentation as it just looked like a brown lump of meat when it came out. I suppose I can’t really complain – I asked for medium-rare and I got medium-rare. After cutting into the burger and then taking my first bite, I realized the bread might be problematic. The focaccia wasn’t bad but it absorbed a lot of the juices from when the beef was cut and was unable to maintain its structural integrity near the cut line. I’d imagine if the bread hadn’t been grilled, the juices would have migrated all the way through the bread and turned into a complete soggy mess. As it was, it managed to keep only to the area where the beef was cut into. The beef itself was well-cooked and flavorful – the aioli may have helped in that respect but the natural flavor of the beef really shines here. 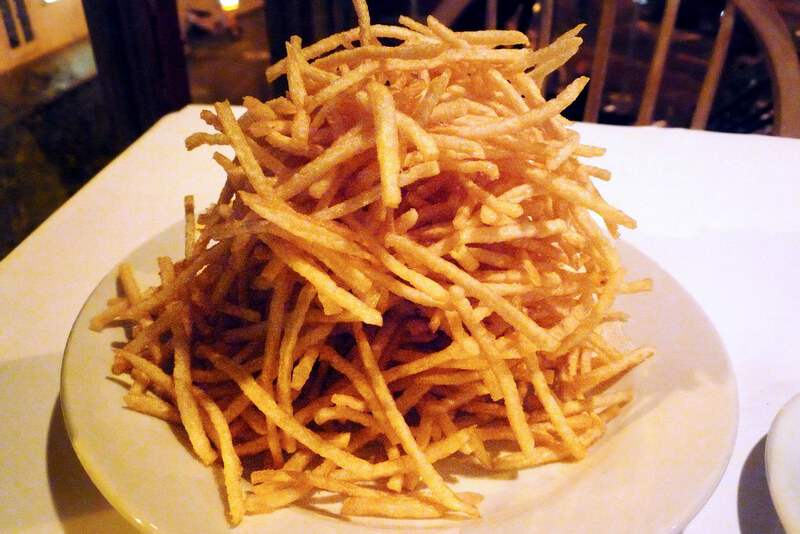 On the side, I also ordered their shoestring potatoes which comes in a giant mountain. It’s definitely a portion large enough to share with at least a second person. I barely managed to eat through half the fries before I finally gave up on trying to finish them. They were crispy and well-salted – I was tempted to keep mowing through them but at some point, you gotta recognize you’re fighting a losing battle. 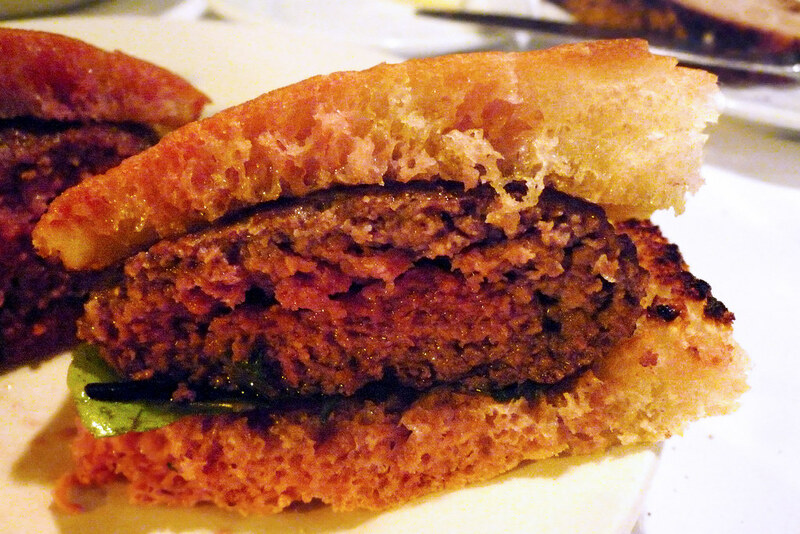 There’s no doubt that, bun aside, Zuni Cafe makes a good burger. My problem with it was cost – the burger itself (no sides, no toppings) was $15. The shoestring potatoes were an additional $6. If you add toppings like cheese or onions, you’re looking at around another $2 each. My burger and fries came out to $21 but most people will go for the blue cheese at the very least and will walk away spending $23. For a proper frame of reference, the burger at The Spotted Pig is $17 and that comes with the cheese and the fries; also, their burger is better. I know I can’t really compare the two since they’re in different cities but money is money no matter where you spend it and if I had to choose between the two, it’s The Spotted Pig, hands down. The bottom line is that while Zuni Cafe makes a good burger that may be good value by San Francisco standards, it’s just not really great bang for the buck by my standards. Ultimately, that’s all that really matters to me. Zuni Cafe. 1658 Market Street, San Francisco, CA 94102. [Show/Hide Map] (415) 552-2522. Aha, a newfound appreciation for the ol’ spotted pig burger, eh? @Kate As I find more burgers in that price range, the burger at The Spotted Pig starts looking better. I already liked their burger but it’s beginning to appear as though there’s no comparison to it in that range.